Be the first to share your favorite memory, photo or story of Cletus. This memorial page is dedicated for family, friends and future generations to celebrate the life of their loved one. 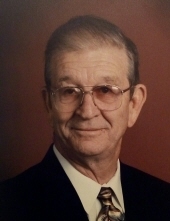 Cletus Wark passed away March 16, 2019 at the age of 95. A Funeral Mass was said at St. Vincent de Paul on March 21, 2019 with burial at the Houston National Cemetery. He graduated from St. Thomas High School and served four years in the US Army Air Corp during WWII in the Pacific Theater. Cletus attended the University of Houston and was also a member of the VFW, Post 5619. He was a charter member of KC Council 3910 and a founding member of St. Vincent de Paul Parish. Cletus is survived by his wife of 69 years, Betty; their children, James, Mike, Polly, Tim, Pat Wark and Becky Seale, (and spouses); nine grandchildren and six great-grandchildren; and sister, Nettie Gordon. Memorials may be sent to St. Vincent de Paul, 6800 Buffalo Speedway, Houston, TX 77025 or the charity of your choice. To send flowers or a remembrance gift to the family of Cletus J. Wark, please visit our Tribute Store. "Email Address" would like to share the life celebration of Cletus J. Wark. Click on the "link" to go to share a favorite memory or leave a condolence message for the family.